After running some tests, we determined that MariaDB 5.5 was the best option for us and our particular workload. For most of our servers, it did not matter whether we use Percona, MariaDB or Oracles MySQL, but our Bugzilla servers really benefited from MariaDBs better subquery optimization, so we went with that. We had set up some Percona 5.5 servers over the spring/summer of 2012, when we moved some of our infrastructure to a new data center. 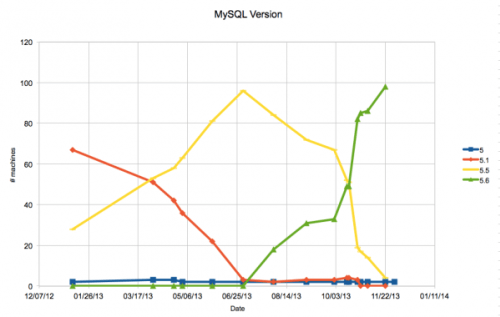 We upgraded to MySQL 5.5 to be on a recent version of MySQL. In the middle of the year, we had a choice should we stay where we were, or should we upgrade? We had no particular directive from developers to upgrade for the new MySQL 5.6 features. However, we have been doing more and more digging into our systems, and we really wanted the performance_schema features so we could dig even more. We want to be able to parse queries in real-time, perhaps with Anemometer without having to take an offline log file and run pt-query-digest on it. So, we chose to upgrade to MySQL 5.6. Unfortunately, there were no other GA products to test against by mid-2013, neither MariaDB nor Percona had a GA 5.6 product, so our bake-off was functional only, not performance-related. Oracles MySQL 5.6 passed with flying colors, and so we proceeded to upgrade. Now, we have a recent and consistent version of MySQL installed, that we can work with to gain insights into our systems. A pretty great goal to have been met for 2013!